This week Coinmama is pleased to announce another addition to our lineup of cryptocurrencies by adding the distributed gross settlement asset Ripple (XRP) to our exchange. 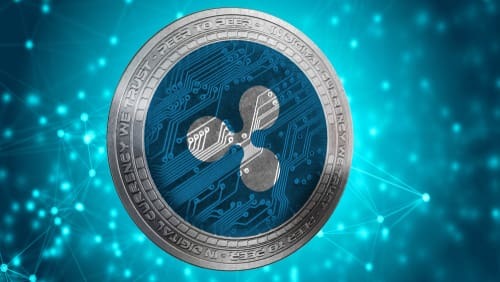 Ripple is one of the oldest cryptocurrencies with its inception dating back to 2012 and the XRP market is the third highest valued capitalization in the digital asset economy. In today’s editorial, we’re going to give our readers an in-depth look at the Ripple XRP and why some investors believe the distributed ledger technology will revolutionize the banking system. The distributed ledger technology protocol Ripple and it’s native currency XRP is a well-known settlement system and digital asset. The system was released in 2012 and was co-founded by Jed McCaleb and Chris Larsen. Ripple Labs considers the project a transaction protocol, a currency exchange, remittance network, and real-time gross settlement system (RTGS). Ripple.com states that the system is the “only enterprise blockchain solution” for global payments. “Ripple connects banks, payment providers, digital asset exchanges and corporates via RippleNet to provide one frictionless experience to send money globally — Built on the most advanced blockchain technology that is scalable, secure and interoperates different networks, and also provides optional access to the world’s fastest and most scalable digital asset for payments, XRP,” explains the firm’s web portal. Ripple has slowly gained in popularity since its inception and has always been a top ten contender since then as well. Today Ripple is the third highest valued market capitalization with $26.43 billion USD in its coffers. Moreover, lots of banks have been using XRP for gross settlement purposes and the Ripple protocol’s notoriety stems from being banker and establishment friendly. Because dozens of banks like Santander, and the central bank for the Kingdom of Saudi Arabia are testing Ripple’s XRP system investors believe the currency will gradually grow in value. There’s also the system ‘xRapid’ which helps payment providers and other financial institutions who are looking to debase liquidity across the board. The xRapid protocol allows for the lowering of liquidity costs by utilizing XRP’s instant liquidity processes. The CEO of Ripple, Brad Garlinghouse, has also revealed that over 100 banks now rely on the distributed ledger system and he says there will be a lot of positive news in 2018. The global head of infrastructure innovation at Ripple, Dilip Rao, explains that there will be all types of financial institutions using the system including the world’s central banks. “Central banks around the world are leaning into blockchain technology in recognition of how it can transform cross-border payments, resulting in lower barriers to trade and commerce for both corporates and consumers,” Rao details. Reputation: Ripple XRP has a long-running reputation since 2012 and the currency is a top contender among 1600+ digital assets that exist. The founder of Ripple, Chris Larsen, is a well-known individual within the cryptocurrency space. Fast and inexpensive to Send: Sending XRP is very fast and outpaces most blockchains today and sending funds is very inexpensive comparatively as well. Banking Friendly: Ripple is well known for the system to be used by lots of well-known banks and financial incumbents. Coinmama believes some our customers will be interested in acquiring Ripple for their portfolio and we want to make the process seamless. XRP is available for purchase today with our unique package offerings. Check out our XRP packages today priced in USD and EUR!